On Feb. 5, an impressive group of professionals from the Chicago area who are typically busy with putting together work teams and business deals were challenged to try a whole new brand of collaboration with Unified Sports® and Special Olympics Illinois. 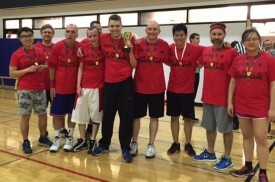 Several hundred employees from Capital One, Accenture, Deloitte, Resolution Life and Baxter came together for the inaugural Chicago Corporate Cup basketball tournament sponsored by the CapAbilities Network within Capital One®. Thanks to a thoughtful group of knitters, many Winter Games athletes found warmth and comfort on top of Chestnut Mountain in Galena this year. 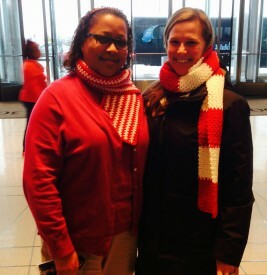 Andrea Whitmore models a scarf with SOILL’s Jacquelin Kogut. Andrea Whitmore met Special Olympics Illinois staff members at a Blue Cross Blue Shield volunteer event where a number of organizations present their purpose and mission and share opportunities where BCBS members can get involved. In her spare time, Whitmore is the Vice President of the Knitters of the Dunes, a knitting guild in Indiana where she resides. 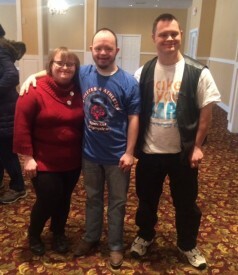 Special Olympics is one of the organizations supported by that guild. Get the latest news on Heartland/Area 6 by reading the February Area newsletter. 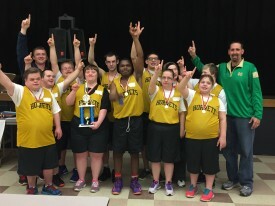 The Mattoon/Charleston Hornets basketball team was unsure of what to expect when arriving at the Special Olympics Illinois District H Basketball competition on Sunday, Jan. 31, at the Wesclin High School in Trenton. Even though the team entered the competition with a 7-0 game winning streak, the Hornets had just started their team in November and they had no past experience at a District basketball competition. 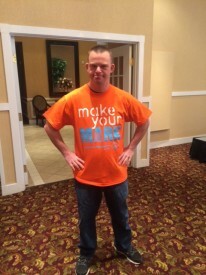 Special Olympics athletes in SOILL West Central/Area 11 got the chance to meet Tim Harris (top photo), owner of Tim’s Place Restaurant in Albuquerque, N.M., at Breakfast with the Champions and the 5th Annual Rhinestones and Rodeo fundraiser on Feb. 13 in Quincy. Special Olympics athlete Christine Maxwell (bottom photo) of Heroic Fitness and North Suburban Cook/Area 18 also spoke at the Breakfast. Thanks to Down Country, a rural awareness and education initiative, for inviting us! Get the latest news on Sangamon/Area 17 by reading the February Area newsletter.